In the episode ‘Shoot’, young suburban housewife and mother Betty Draper shocks the small-screen audience of ‘Mad Men’ by calmly shooting at her neighbour’s pigeons with a BB gun. Her perfectly made-up face, hair and manicure are at stark odds with her gun and the cigarette that dangles from her mouth. The scene reveals the extent to which oppressive domesticity has strangled her and the lengths to which she might go to strike back. 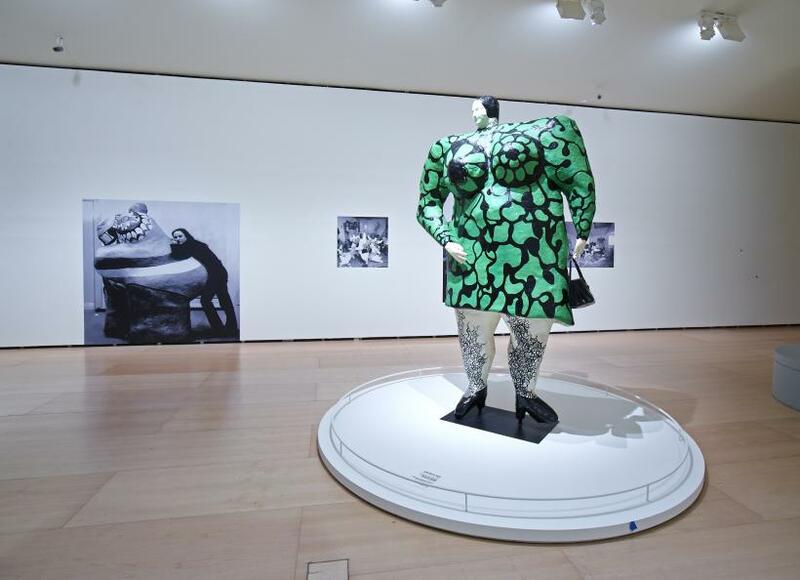 Large black and white photographs of a wide-eyed Niki de Saint Phalle, glamourous in diamonds and furs, appear in the first sections of her major retrospective at Museo Guggenheim Bilbao. Like Betty Draper, Franco-American artist de Saint Phalle was a fashion model in the late 1940s and the 1950s. These photographs from ‘Vogue’ and ‘Life’ markedly contrast with de Saint Phalle’s ‘Auto-portrait’ (c. 1958-9) shown nearby. Pieced together from broken crockery, this is a far cry from the beautiful magazine debutante. 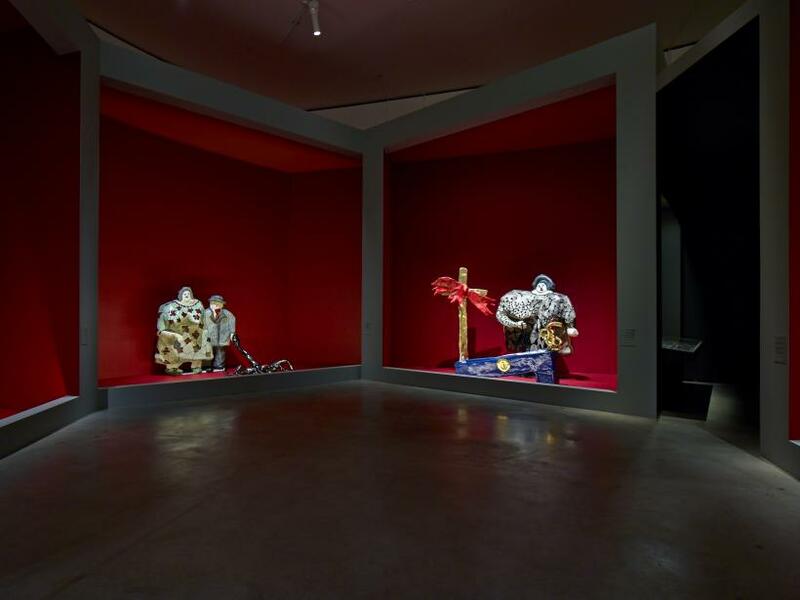 Other assemblages such as ‘Night Experiment’ (c.1959) integrate revolvers, meat cleavers and razor blades thrashing about or trapped in thickly painted surfaces among toy train tracks and shoe heels. 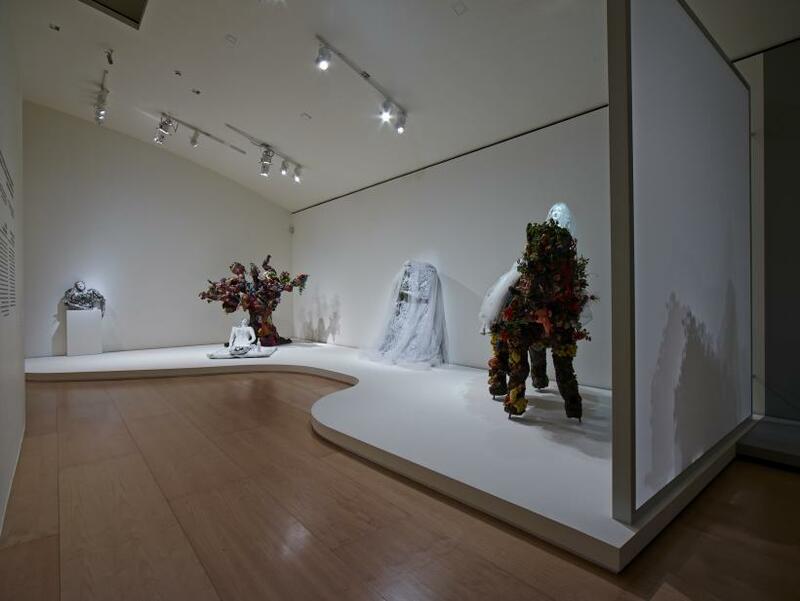 Free-standing three-dimensional pieces incorporate plastic dolls and wedding dresses in more sinister narrative tableaux articulately recalling the frustrations of motherhood and family life so acutely felt. In 1960 de Saint Phalle left behind a wealthy lifestyle, small children and her first husband for a new life. “Painting calmed the chaos that shook my soul” she noted. 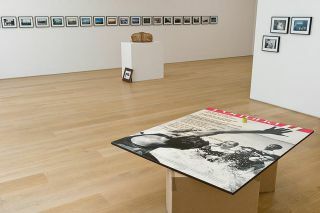 Such emotions are made palpable by the sound of gunfire that punctuates the initial rooms of the exhibition. 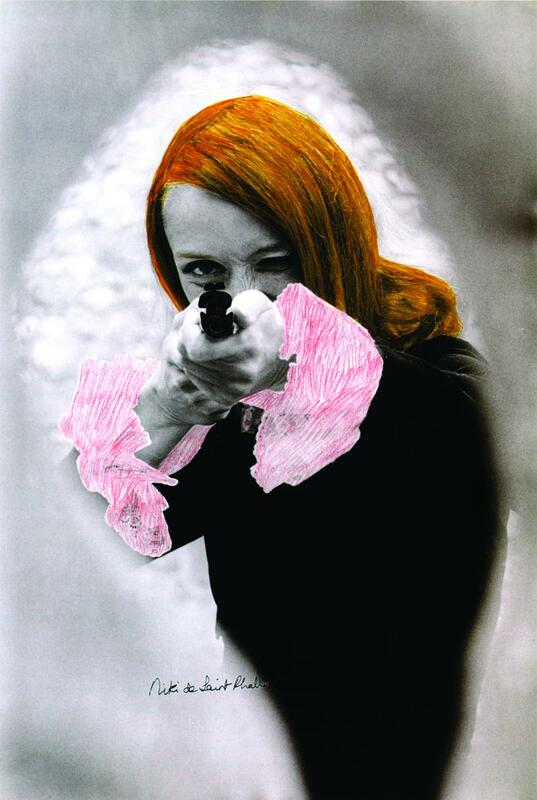 Contemporary films show de Saint Phalle shooting at paintings with a rifle. 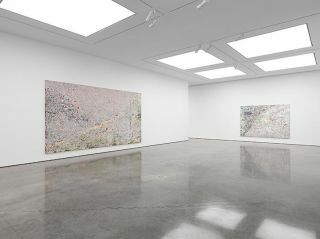 Bleeding, coagulated forms are typical of these ‘Shooting Paintings’ or ‘Tirs’. Bright gushes of liquid paint stain bullet-ruptured grounds made up of broken object fragments coated with white plaster, for instance in ‘Grand Shoot - J Gallery Session (Grand Tir - Séance galerie J)’ (1961). 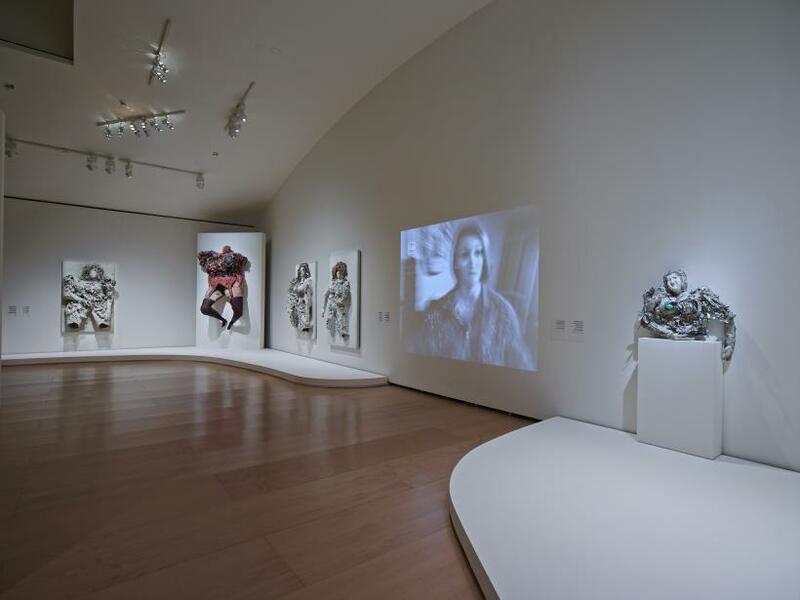 Some of these works were made in collaboration with other artists (including Jean Tinguely whom she married in 1971) in front of live audiences in the US and France. In films made for French national television, shocked audiences gasp and titter, and news reel voiceovers quip, surprised to see a beauty with a gun shooting at art; to see a young, vibrant woman equipped with fierce independence and a ‘man’s’ power. A further film shows the artist directly taking aim at the camera, and in another, raging about politics. This film concludes with the explosion of a canon. 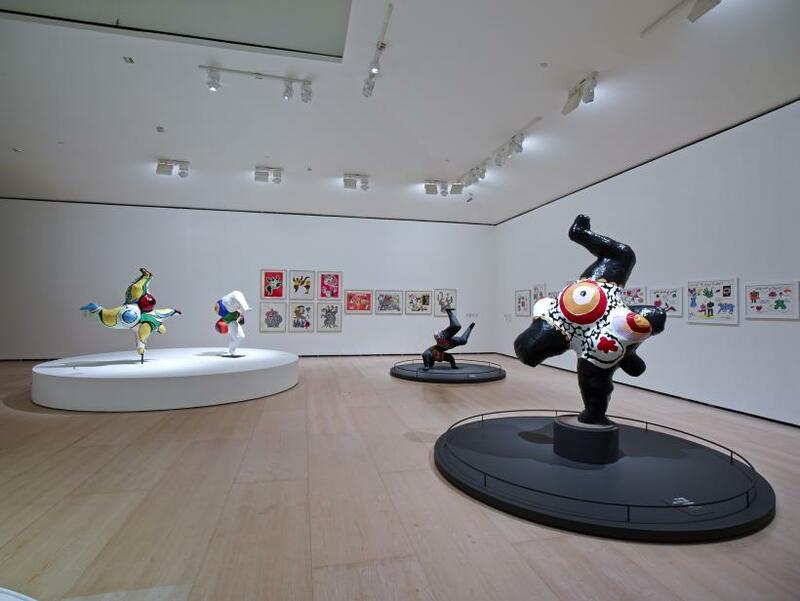 A large proportion of the exhibition is dedicated to de Saint Phalle’s popular ‘Nana’ sculptures. 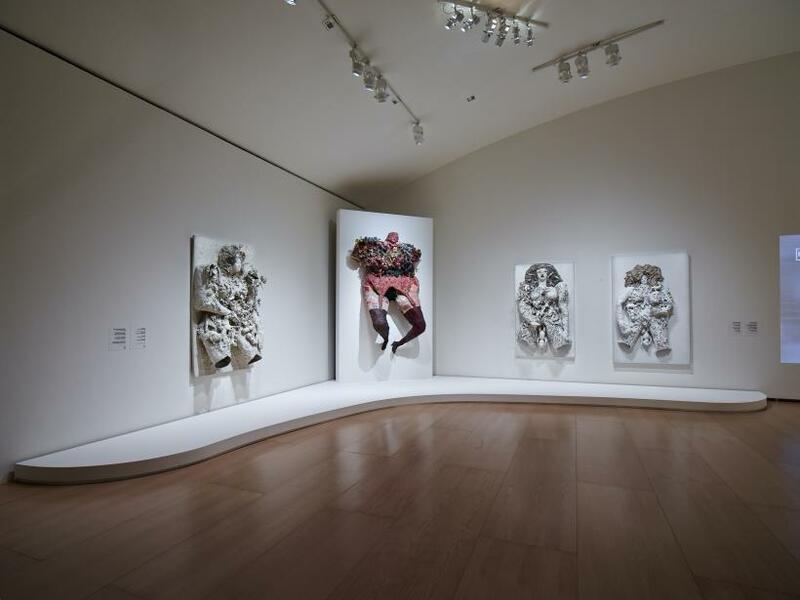 Highly decorative, rounded women of varying sizes can be found dancing and cartwheeling across the gallery in painted polyester. There is a lightness and a freedom to these figures despite their size and apparent weight - a joyful tribute to the female body. Additional studio portraits and film footage of the artist are embedded in the display - reminders of her slimness and beauty made in counterpoint to these large bulbous figures. 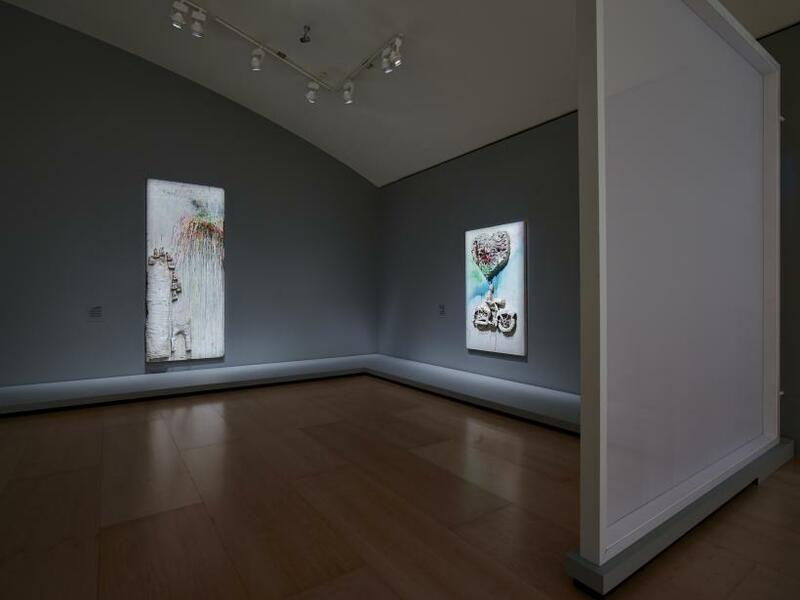 Her ‘Nanas’ such as ‘Dolorès’ (1966-95) and ‘Gwendolyn’ (1966-90) are cleaner, glossier and neater than the earlier, angrier sculptural assemblages and paintings. 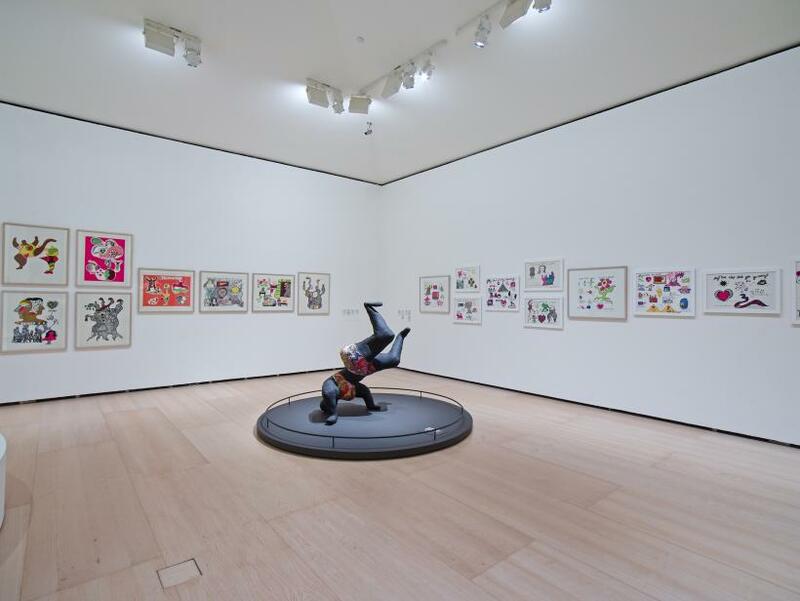 Their celebratory tone is continued through a section devoted to de Saint Phalle’s large public projects such as ‘Tarot Garden’ in Tuscany, works that she continued to develop up until her death in 2002. The ‘Nanas’ are radically unlike her earlier works, and unlike one of the most striking pieces on display, the psychoanalytical film ‘Daddy’ (1973) made with filmmaker and writer Peter Whitehead. 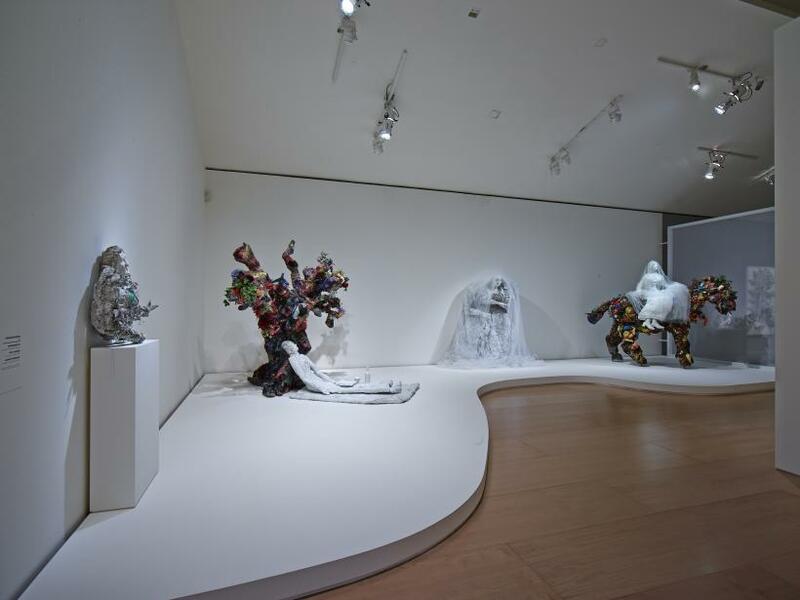 Surreal, unsettling and witty, many of the props used within its narrative return the viewer to de Saint Phalle’s violent assemblages. 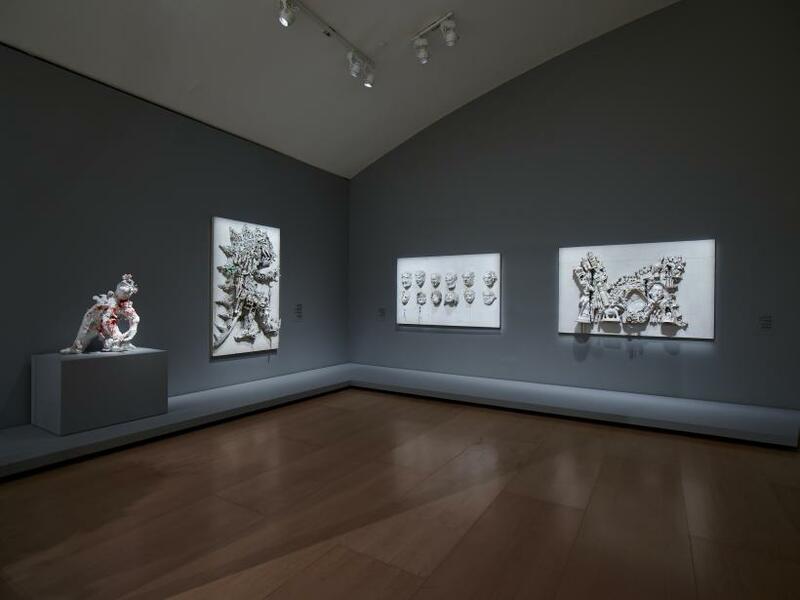 The best of the artist’s works draw deeply from the intensity of her personal experiences. ‘Daddy’ is autobiographical in nature (the artist was sexually abused by her father) and the film overtly interrogates roles of wife, parent, child and lover. It also recalls the films made of her ‘Shooting Paintings’. In each, de Saint Phalle uses her charisma, wit, beauty and her body as weapons as powerful as her rifle. 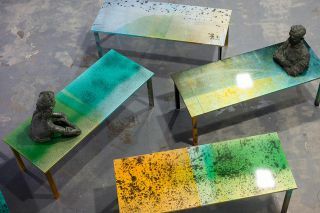 While the decorative aesthetics of her ‘Nanas’ and her public projects are exuberant and optimistic, it is the visual intensity and urgency of her perfectly aimed shots that echo throughout the exhibition. It is the image of a beauty with a gun that continues to reverberate.